When you become a vegan or vegetarian, holiday dinners don't have the allure they once did. If everybody else is looking forward to Thanksgiving and Christmas dinners centred around a big (let's face it, dead) bird, the herbivore might feel a little left out. Whether you are said herbivore or you are welcoming one to dinner (son has a new girlfriend, huh? 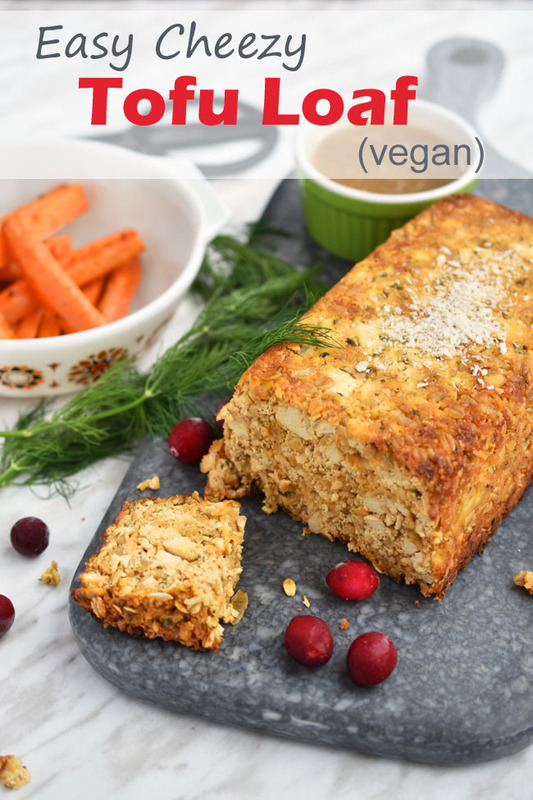 ), this Easy Cheezy Tofu Loaf is a simple addition to your festive food menu. This tofu loaf recipe involves mashing up extra-firm tofu with other simple, natural ingredients in a big bowl, and then flattening the mixture into a loaf pan with olive oil. Bake for one hour. So easy. 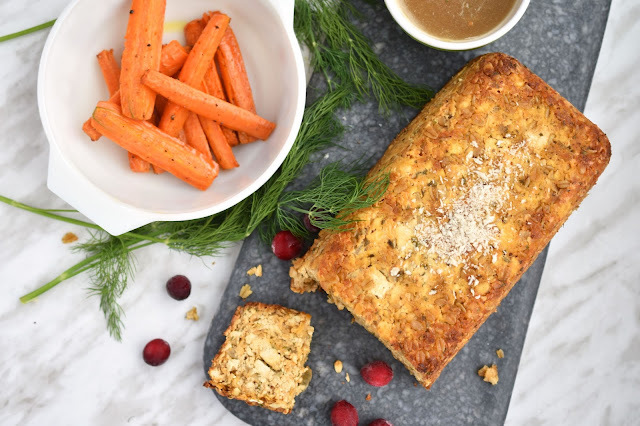 You could even make the tofu loaf the day before and reheat it on the day of dinner, if the demands of timing 10 vegetable side dishes are going to send you over the edge. 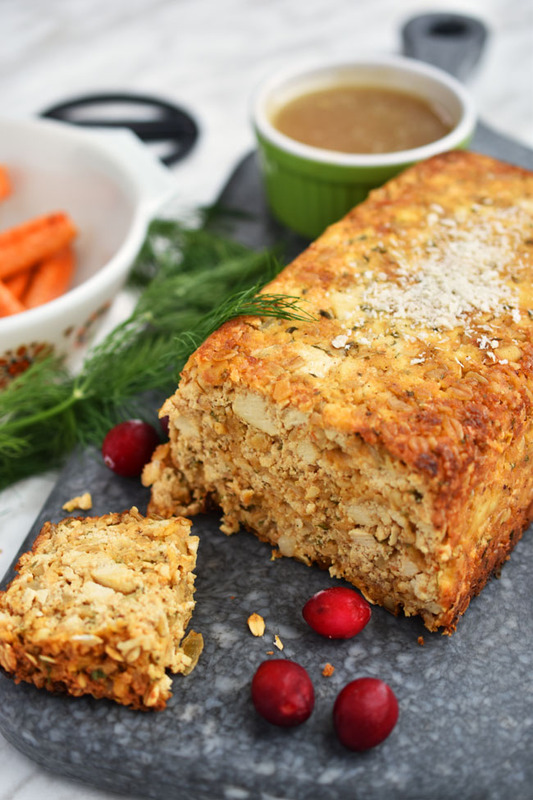 We have been enjoying this Easy Cheezy Tofu Loaf for years in our home. This recipe is modified from an old but good recipe in the classic Tofu Cookery . 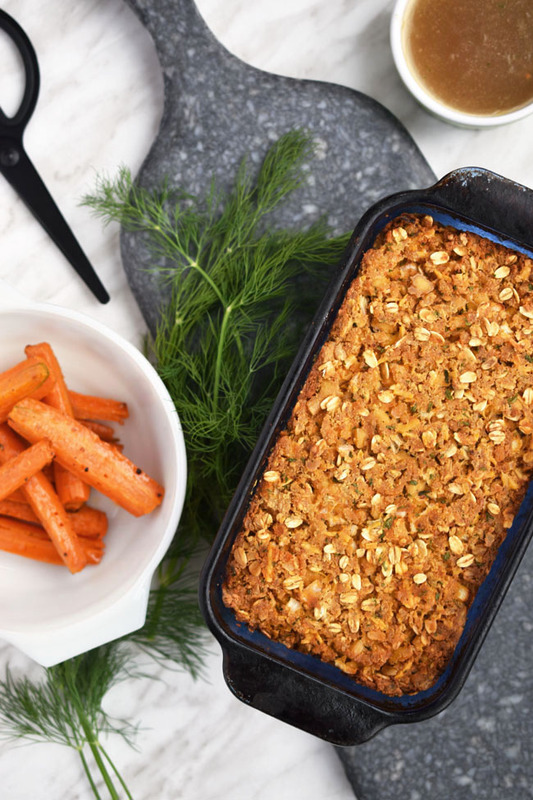 The "cheezy" factor in our recipe comes from shredded vegan cheddar and a touch of nutritional yeast, which is also a good source of vitamin B12. 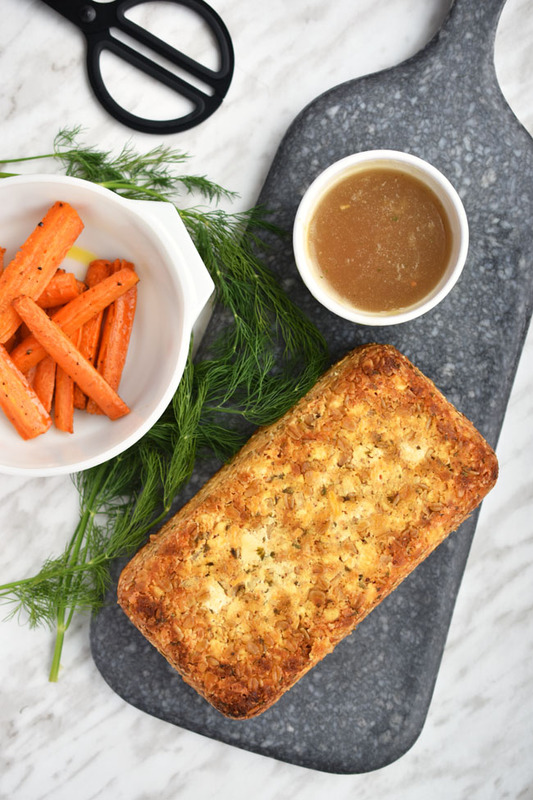 I like to serve this tofu loaf with mushroom gravy or this simple vegan gravy. Serve with roasted carrots, mashed potatoes (made with vegan margarine and non-dairy milk) and my 3-ingredient Simple, Natural Cranberry Sauce and you've got yourself a festive holiday meal sans animal products. 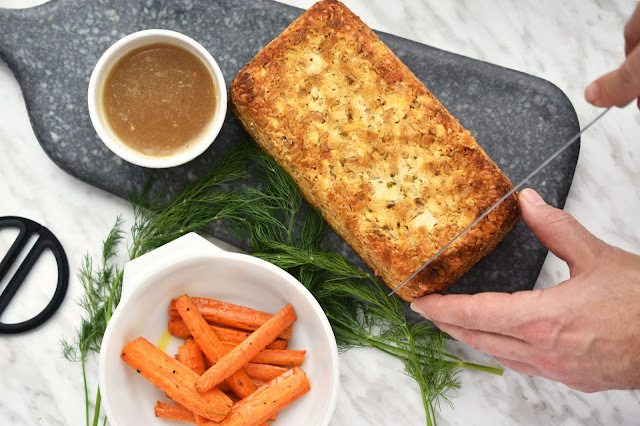 To make this Easy Cheezy Tofu Loaf friendly to the gluten-free folks, omit the Panko bread crumbs and add more oats or use gluten-free bread crumbs. It's a pretty forgiving recipe, so feel free to switch up the flavours. Leave out the "cheese" if you wish. Add your favourite herb. Whatever. Just ensure that the mix still feels like it's going to bind together in the pan. You'll be able to tell when you press a bit of it together in your hands. This tofu loaf is so easy to make that you can even prepare it on a weeknight. While the loaf cooks, change out of your work clothes, assemble a simple salad and bake a couple of potatoes. We often have tofu loaf for Sunday dinner too. Crumble tofu into a large bowl. Add all ingredients up to and including garlic powder. 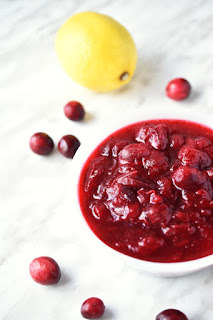 Mix together with a spoon, or use your hands to bring the mixture together. Pour the olive oil into an 8 1/2" x 4 1/2" x 2 1/2" (approx 1 1/2 quart or 1 1/2 litre) loaf pan. Press the tofu mixture firmly into the loaf pan. Bake for 60 minutes. The top will be golden brown and the edges a bit crispy. Let cool for 10 minutes or so before removing from pan (or slice in pan). This looks delicious! Tofu is one of my fave ingredients & I love a Christmas recipe. Wonder if I can make this the night before and bake it next day? Should be ok, right? I’d like to do it on a weeknight. Hi Donna, Yes, for sure! Cover it up tight and put it in the fridge until you bake it and it should be fine. Enjoy! Oh cool!...I'm gonna get the ingredients at the store this weekend. Thanks so much!! Okay, this is going to be a dumb question so forgive me in advance. You say up to the garlic powder. Does that mean the garlic powder goes in with the rest, or it's reserved on the side? If it's reserved, what does one do with it? This looks really good! I am vegan and gluten free because of health reasons and i will enjoy this.